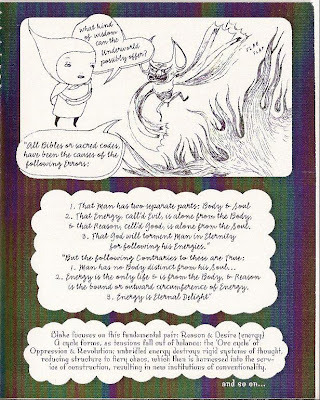 Comicosmos by Beth Haidle Beth labels Comicosmos as a "non-fiction zine reviewing ideas, topics, & books." The two issues she sent me deal with Willliam Blake's The Marriage of Heaven and Hell and "Shaker Philosophy... in the kitchen! Cooking for the heart, mind, & soul." Both issues are a nice blend of art and text. The Shaker issue even includes recipes, one of which I'll have to get Kate to try - Chilled Bluberry-Lavendar Buttermilk Soup. Both issues, with 12 pages counting the covers, are packed with information. You'll finish each with a familiarity of topic not expected by the time you set these slim comics down. What wins you over is the art; it's beyond charming. Witness below the cast of characters featuring the Goddess of Garnish and the Seasoning Nymphs from the Shaker issue. The charming quickly switches to sinister in the Blake issue. The bat creature flits from page to page accompanied by fire and serpents illustrating Blake's words and Bible quotes. the back cover if each issue features bibliography, related works, and further studies, in case the reader needs more information. These issues are quick, informative, engaging, and quick to point you to more information should you be interested. 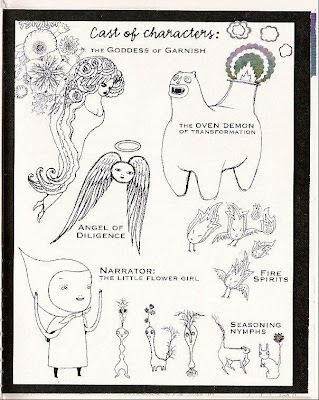 Beth's website has some sublime illustration work and her site dedicated to these zines has some fantastic images from the third issue, Book of Beasts. Please make sure you check out these websites, as I discovered so much great stuff that I was distracted from finishing this review. 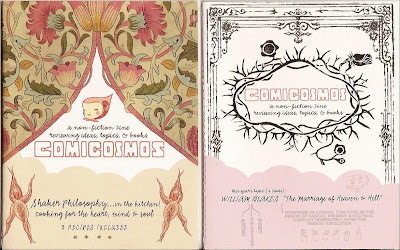 Prices for Comicosmos are $3.50 each from her online shop.